It's always better to avoid a problem completely, than to have it fixed after it happens. With the maintenance service our professional garage door technicians provide you'll be able to prevent a lot of malfunctions, and ensure that your system continues working properly for a very long time. Your door should be able to stay open halfway, and if it can't do that, then its springs need to be adjusted. These hardworking components can be extremely dangerous, so you should never try to handle them on your own. Our technicians will safely check the tension of these units and change it as needed to keep them from overstraining and to ensure your door remains properly balanced. 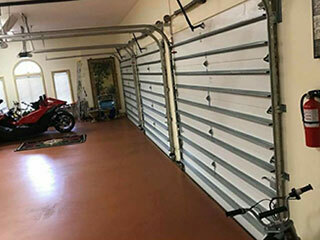 There are a lot of moving parts that make up the complex mechanism that is your garage door. Over time, these parts can sustain a lot of wear and tear as a result of the friction involved in their operation. Our team will lubricate the rollers, hinges and bearings, so that their performance remains as smooth and silent as possible. While we're at it, we'll perform a complete examination of your tracks to ensure they haven't accumulated a lot of rust or dents, and repair any damage we find. To make sure the system is able to reverse when something or someone gets in the door's way, our experts will conduct a couple of tests. We'll check the safety sensors' alignment and make sure that the auto-reverse feature is working correctly. If your system fails our test, we will perform the necessary adjustments, or replace the problematic component so that your door stays safe for you and your family to use. With the maintenance service that our team at Garage Door Repair Hoffman Estates offers you'll be able to continue using your system for a very long time. You'll also save money by avoiding a wide range of problems. Call us today or use our online system to schedule an appointment.